Quick Post: This was pretty good, but I will definitely modify the recipe for next time. I had slightly more than one pound of yellow fin tuna and I seasoned it according to the recipe, which I should have changed. I will make sure to add more lemon, chili flakes and white wine and probably even some lemon zest to the foil packet. Also, I’ll make sure to use a sharper cheese, like the Pecorino Romano or Parmigiano Reggiano cheese. It has great potential to be really flavorful, but it was my fault that I didn’t compensate for the amount of food I made. Thanks for reading, enjoy! Preheat oven to 375 degrees, and bring a large pot of water to boil. Season the water with lots of kosher salt. On a piece of parchment or foil, lay a few of the lemon slices. Place the tuna on top and season with salt, pepper and top with more lemon slices. When the fish has finished cooking, carefully open the foil pack from the top and remove the fish, being careful to keep the juices from spilling. Break apart the tuna into bite size pieces. And combine the cooking liquids with the pasta water. 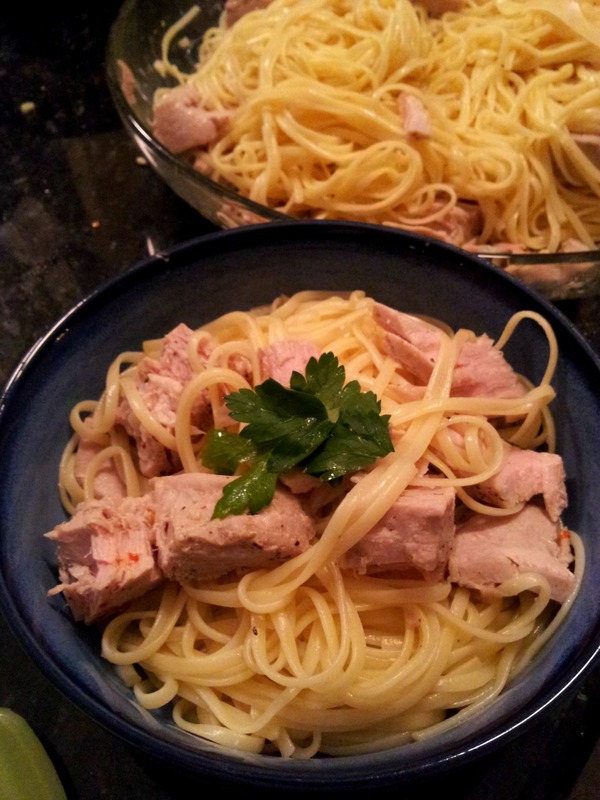 To the pasta; add the parsley, tuna and sauce liquids. Season with more salt, pepper and shaved cheese. Thank you for the tips…i agree with you that it would probably be better with more lemon and a little extra seasoning. It does look tasty.